One of the big international dance festivals, the Berlin based Tanz im August, celebrated its 30th anniversary with a thought-provoking and breath-taking array of works. Presented again by HAU (Hebbel Am Ufer), 30 productions from 18 countries were selected by the artistic director Virve Sutinen. 16 of them were shown for the first time in Germany and four were international premieres. "Bowing to the past and making space for the future," as Sutinen put it, they accounted from August 10 through September 2 for the state of affairs in contemporary dance the world over. Striking at times and puzzling in other instances, the companies and the individual artists presented, confronted, and interacted throughout 11 locations in Berlin. The public enthusiastically accepted the challenge of a festival that did not really deal with dance per-se, but stretched the concept by enveloping new contemporary dance productions. That included extreme sports, which tested the ability of the dancers to overcome fear and physical pain, dance performances that were actual pieces of theatre, and lengthy lecture-like explanations of the importance of specific dance modes. Free outdoor performances, lectures, the launching of the online publication Für Immer Tanz (Dance Forever), workshops and discussions rounded out the festival. The best-known international dance companies ‘framed’ the festival presentations in the big houses. It proved to be a most graceful approach, very much appreciated by the public, since it allowed the audience to follow the development of these renowned companies. 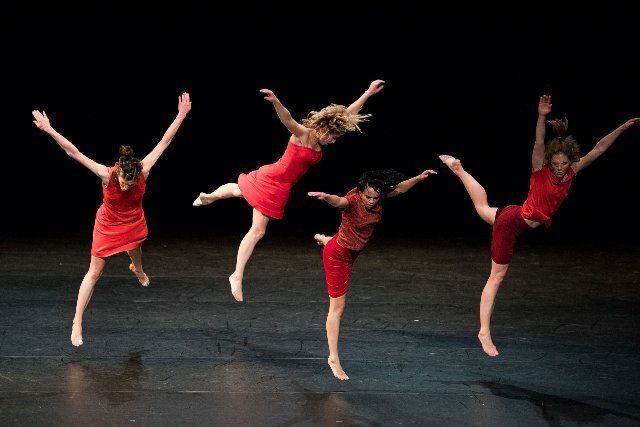 The opening performance/s at Tanz im August by the Ballet de l'Opéra de Lyon Trois Grandes Fugues offered interpretations of Beethoven's Grand Fugue by the companies of Lucinda Childs, Anne Teresa De Keersmaeker, and Maguy Marin. It beautifully showed the dance developments in chronological sequence, with the earliest, Lucinda Childs, being still quite close to classical dance. Then, Maguy Marin's company offered the most contemporary interpretation. The last opening at the end of the festival took place at the Volksbuehne. It belonged to the fabled Pina Bausch Tanztheater, Wuppertal, that had invited the Norwegian guest choreographer Alan Lucien Øyen to present Neues Stueck II (New Work II). He explored the boundary between dance, theatre, text and film to show the complexity of the human experience. It was questionably successful since it seemed overburdened with theatrical sketches, video clips and statements. A constant moving of stage settings brought new theatrical episodes to the fore. All pieced together with short dances became rather tiresome and defeated in the end the positive effect of the trans-disciplinary approach. Between these cornerstone events much was to be taken in. Some pieces were excellent, some awkward, some breathtaking, yet all of them attempted to move into new avenues and tried to break the mold of a pure dance protocol. 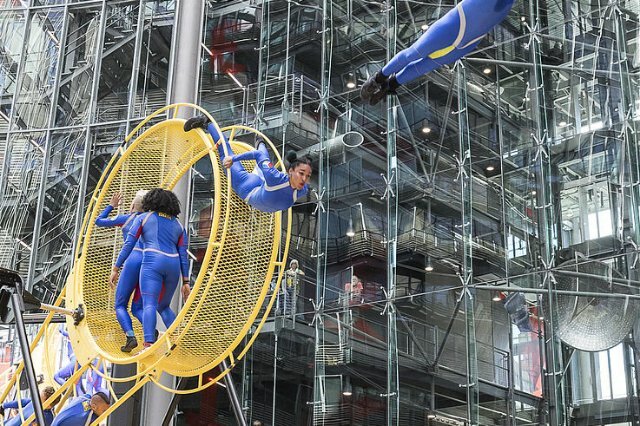 Extreme and excellent and definitely challenging in all aspects was the spectacular outdoor performance at the Sony Center by the New York group STREB Extreme Action. Around 5000 onlookers breathlessly followed Elizabeth Streb's choreography, where she has her performers interact with machines. They are rocketed into the air and plunged to the ground, all along dealing with acute fear and real potential for injury. 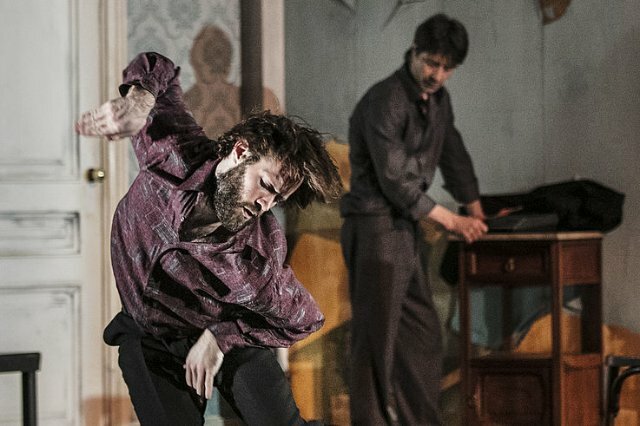 New York had more to offer, genre-exploding and well known for it came the Big Dance Company with a German premiere at the Deutsches Theater. It is titled 17c, a savvy interpretation by the artistic director and choreographer Annie-B Parson of a somewhat perverse 17th Century diary using music, text, video and lots of humorous action on stage. Paul Lazar, one of the dancers/actors in this work, returned later, on a smaller stage of Deutsches Theater, with a solo piece - a homage to the composer John Cage, that was quite intriguing but more on the anecdotal side. Another spectacular performance, where theatre and dance reached glorious harmony, was the German premiere of Marcos Morau's company La Veronal with Pasionaria. The Spaniard choreographed this work as an interdisciplinary piece depicting a struggle where humans lose out against the encroachment of robots. It turned out to be one of the highlights of the festival. Again totally different, but quite convincing, was the merging of dance and poetry by the duo Mal Pelo (María Munoz and Pep Ramis) with their performance The Fifth Winter at the HAU1. To pass the fifth winter together they moved around and recited poems by the Italian poet Erri di Luca, thus creating a personal duette about the passing of time. Much different, not lyrical at all, and at first somewhat off-putting, was Silvia Gribaudi's R.Osa_10 Exercises For New Virtuosities at the HAU III. Inspired by the voluptuous Fernando Botero's paintings, she had the very overweight Claudia Marsicano in a bathing suit on stage conducting exercises with the audience. What seemed at first an unnecessary exploitation, turned the audience around. The charm of the performer let everyone forget the bodily ‘offense.’ A better proof of an amazing change of perception as soon as emotions color a visual impact is hard to come by. Not very convincing - actually quite annoying - was the attempt by the Finnish choreographer Maija Hirvanen at HAU III to also choreograph a lecture about Art And Love, side-stepping movement almost completely for a pretentious lecture on the subjects of her piece. Although there were other works in this 30th edition of Tanz Im August more along established lines, it was the inclusion of so many new approaches to this festival that made it special. Deconstruction, strong attempts to break with established norms, may very well describe this festival. Thus, the Brazilian company Grupo de Rua under the artistic director and choreographer Bruno Beltrão adds with INOAH a powerful statement about the violent survival schemes in their environment. He had his 10 dancers use elements of street dance, break dance and hip-hop to emphasize the precarious state of socioeconomic relations in many parts of the world. Perhaps, Western democracies are not far behind.